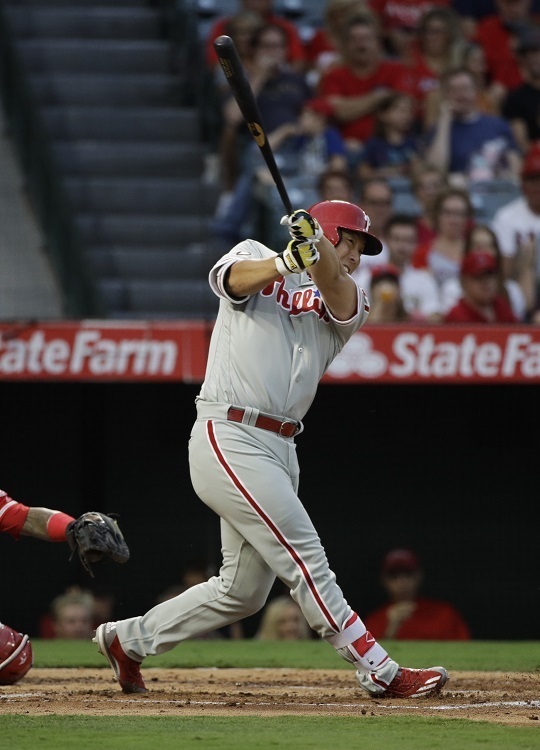 Kim Hyun-soo collected his first hit as a member of the Philadelphia Phillies, a double, against the Los Angeles Angels on Tuesday night. Kim, who was traded from the Baltimore Orioles on Saturday, was making his second start in his new uniform. He batted in the eighth spot in the lineup as the Phillies’ designated hitter. He got his first plate appearance in the second inning with one out, and lined a 2-2 breaking ball from Angels starter Ricky Nolasco into the right field corner for a standup double. Kim also flew out, struck out and drew a walk to finish the day 1-for-3. He is now hitting .233 on the year. Angels designated hitter Albert Pujols went 3-for-5 with a double and a home run, driving in 5 runs of the Angels’ 7 runs in their 7-1 victory. The game was the first of a three game series between the two teams and will conclude Thursday.